Strand length: 2.75. 10 eggs per strand. 3 strands/ pack. Each egg is about 1/4″ in diameter (7mm). There are no other salmon eggs like these on the market. They are scented, look and feel like the real thing, even down to the natural sheen. Eggs can be fished as strands, tied into clusters or fished individually. Also used as trailers. Great for fresh and saltwater fishing. Ice fishing, too. Crappie and bass love them when fished as a strand. Also effective for trout, sunfish and other fresh and saltwater species. 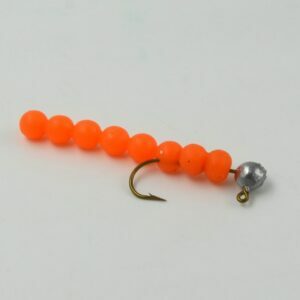 Put these baits in the water and fish will find them. 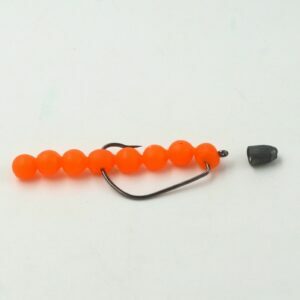 Super stretchy and long lasting through many catches on one egg or strand. Floating. Scented. Some models glow. Biodisintegratable. Phthalate & toxin free. Common rigging methods for crappie, sunfish and bass.